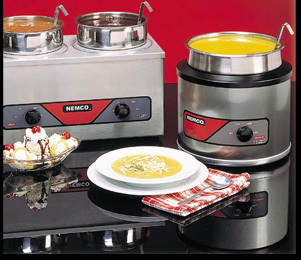 NEMCO stainless steel Countertop Cookers and Warmers improve your flexibility and let you keep food within cooking and serving guidelines. Designed for versatility in a wide range of sizes, Band heating distributes heat evenly to prevent hot spots. Compact, twin warmers have separate thermostats and balanced heat systems for maximum convenience and control. Stainless steel construction ensures durability and prevents pitting or staining. 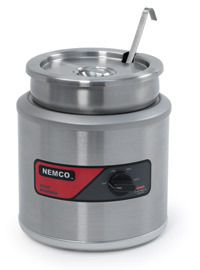 NSF and UL certification on all Nemco Warmers and Warmer-Cookers. Rectangular Countertop Warmers (and warmer/cookers). Attractive enough for serving lines, round warmers keep soups, gravies, BBQ, hot dressings and dessert toppings warm and appetizing. Great for the back bar too. Models also available with inset, ladle and cover included. Price: $1,370.60 with Free Shipping! Fluff, freshen and steam things up with the versatile counter top Fresh-O-Matic steamer. The Fresh-O-Matic steamer, around since the 1950’s and still going strong! Discover why no professional kitchen is complete without the Fresh-O-Matic! It’s the perfect way to instantly deliver freshness and flavor to your pre-cooked and frozen foods with one simple push of a button! Please call us toll free at 1-877-386-7766 if you have any questions about the Newest Generation of Fresh-O-Matic Steamers by Nemco. Special UPS Ground flat rate shipping on this product. Please call for Express and Next Day Air Shipping rates. Orders may be placed by phone (1-877-386-7766), secure order form, or online shopping cart. 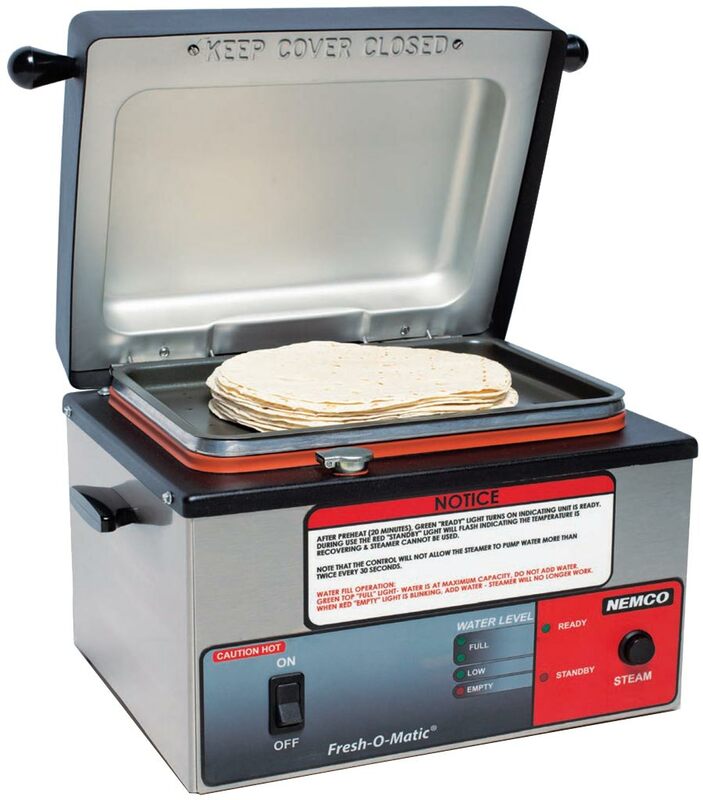 Pan Capacity: 11-1/4" x 7-1/4" x 1-1/4"
Electrical: 120 V, 60Hz, 12.5 Amp, 1500 watts. Free shipping to USA destinations (contiguous USA) via UPS Ground or FedEx Ground. Also In Stock for Store Pick-Up. 25 pk. Re-usable Insert Pans 11 1/4" x 7 1/4" x 1 1/4"
100 pk. Re-usable Insert Pans 11 1/4" x 7 1/4" x 1 1/4"
We offer the entire line of Nemco equipment. Contact us for other items please. 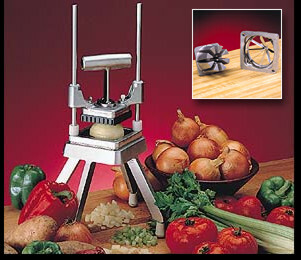 The Easy Chopper is the original, most effective answer for fast, easy, efficient chopping. Comfortable, weighted handle does most of the work for you to cut cleanly in one stroke. Super-sharp, stainless steel, interchangeable cutting grids let you perform six operations with one machine, including four-, six- and eight-section wedging. Built for years of reliable performance. Suggested Uses: Use for fast, easy chopping, cutting and dicing of onions, tomatoes, potatoes, celery, peppers and other firm vegetables. Perfect for salsa and pizza toppings. Great for wedging citrus and other fruits, using the wedging kit. The Easy FryKutter uses an exclusive short throw handle and superior engineering to improve leverage for smooth, easy cutting or wedging in just one stroke. Works with natural body motion to eliminate awkward stretching and reduce operator fatigue. Built to last under the toughest day-to-day conditions. Slide-in, slide-out wall bracket fits the same mounting holes as most other machines. We recommend using #55641 Wall Bracket (not shown) which allows easy slide out removal of unit for cleaning. Suggested Uses: Cut potatoes for french fries and cut carrots and celery sticks. Chop onions, peppers, carrots and tomatoes. Wedge tomatoes for salads and potatoes for steak fries using the wedging kit. Great for wedging fruits too! 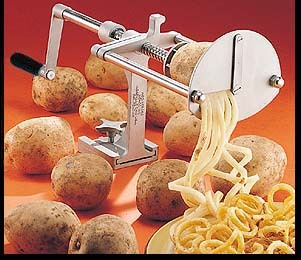 Potato Cutter Spiral Fry lets you turn potatoes into platefuls of uniquely appetizing, fresh, thin spiral fries that serve up big profits for you. 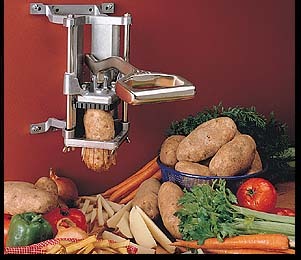 Simply load a potato and turn the easy-action screw drive. No peeling required. Easily releases and retracts for fast reloading. Preset drive depth protects blades from contact with metal parts. Heavy-duty construction adds durability and long life. Mounts securely on any flat surface for left- or right-handed operation. Removes easily for quick cleanup-- just loosen the mounting nut, slide out and rinse. 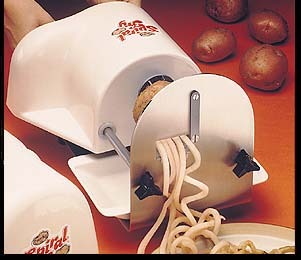 Handles up to a 70-count potato. Now! Fine Cut Garnish Cutter model available. Makes attractive, finely cut vegetable garnishes quickly and easily. *See photo and description under PowerKut Food Cutters. Suggested Uses: Fresh fried potato spirals make a savory, healthful, high-value presentation that customers love. Spiral Fry affords you the highest profit on every serving. With a per serving food cost of only 10¢ and a 75¢ selling price, your per serving profit of 65¢ will make the Spiral Fry your biggest moneymaker ever. Spiral Fry is a great choice for the bar and lounge too. For mounds and mounds of today's most captivating fries and garnishes, you can't ask for more than PowerKut Spiral Fry, Ribbon Fry and Fine Cut Garnish Cutters. It's easy to serve fresh, healthful, delicious fries using the whole potato! Operation is simple-- load, apply steady, even pressure and move the carriage forward. Heavy-duty stainless steel and engineered plastics stand up to tough commercial use. Wipes clean. Holds a 60-count potato. New! Fine Cut Garnish Cutter model available. Makes attractive, finely cut vegetable garnishes quickly and easily. New! Fine Cut Garnish Cutter model available. Makes attractive, finely cut vegetable garnishes quickly and easily. Note: Blade assemblies are interchangeable and available separately. Replacement blades fit both models. Serve curly or ribbon fries hot with vinegar, melted cheese or catsup. Mounds of fine cut garnish improve the value and appearance of any entree. Comes with feeder tray, S-M-L depth rollers, lubricant, and two 9 1/16" blade wrenches. Keep pace with the demand of your hungriest shrimp lovers! 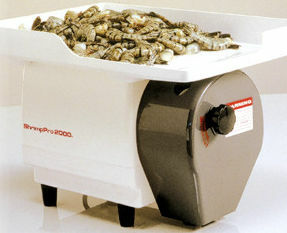 In just one hour, the ShrimpPro instantly and consistently deveins, cuts, butterflies or splits up to 6,000 shrimp! Operators can hand-feed or attach the feeder tray for higher volumes. Either way, the ShrimpPro does all the work with virtually no risk of injury. Compact, portable design saves space and makes for easy storage. Optional mobile workstation saves counter space. The ShrimpPro is the perfect answer for uniform deveining and butterflying shrimp for seafood bars and buffets, Asian stir-fry restaurants, caterers and other seafood specialty restaurants and retailers. 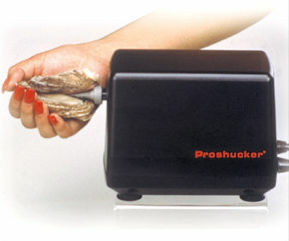 The ProShucker quickly and cleanly opens up to a dozen oysters a minute with virtually 0% risk and 100% yield. A dull threaded bit gently pries open the shell. Works fast and evacuates all mud and shell fragments so you get maximum meat yield with minimum contamination. 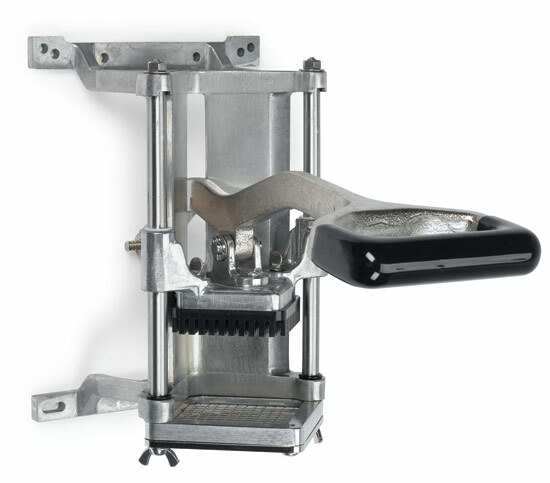 Best of all, the ProShucker is so easy to use, it requires almost no training! Suggested Uses: Perfect for restaurants with oyster bars and seafood buffets, as well as catering operations and supermarkets. Comes with foot pedal, 3 bits/augers and 2 bit replacement wrenches. Available in 120v and 230v. All 230v units are shipped without plug on cords. 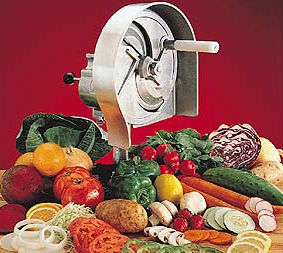 The Easy Slicer is the one slicer you need to make fast, easy work of most fruits and vegetables. Unique, adjustable, stainless steel blade provides a full range of slicing options, from 1/16-inch to 1/2-inch in thickness, for extra versatility and convenience. Simply turn the thumbscrew control to lock in your setting on the easy-to-read calibrated gauge. Use with NEMCO mounting base for a secure workstation, plus easy removal for cleaning and storage. Fixed blade units also available. Suggested Uses: The perfect answer for uniform slicing of fresh vegetables and fruits for salad bars, sandwiches, pizza toppings and more. 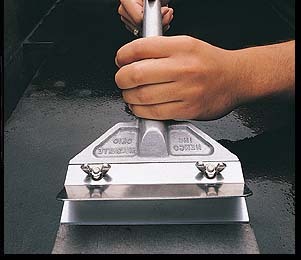 Make the job go faster and easier with NEMCO's unique scraper design for left- or right-handed use. Special, ergonomic shape puts more pressure on the blade for better results. Suggested Uses: Makes the job of scraping baked-on carbon off grills easier and faster. 55825 - Easy Grill Scraper Constructed of heavy-duty cast aluminum with long-lasting stainless steel blade. Replacement blades fit most other brands. Always In stock for store pick-up. Always In stock for store pick-up. NEMCO freestanding infared bulb warmers hold baked, fried, steamed or broiled foods at ready-to-eat temperatures and still keep the food's appetizing appearance over time. Attractive, classic hood design blends easily with every interior style. Custom configurations available with anodized and colored hoods. White, 250-watt infared bulbs standard. Red, 250-watt infared bulbs and white, shatter-resistant 250-watt bulbs also available. 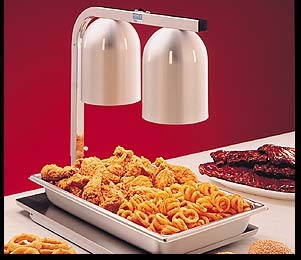 Also great for hot appetizers, such as chicken fingers, poppers and fried shrimp. Suggested Uses: Keep plated foods at ideal serving temperatures, including pies, puddings, breads, rolls, bagels and other baked goods. 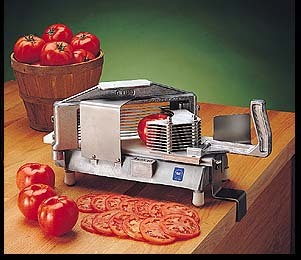 Save time, labor and valuable work space with the Easy Tomato Slicer. A full-size machine, its highly efficient design takes 60 percent less counter space than other, bulkier units. Razor-sharp blades cut with trouble-free precision thanks to a unique self-lubricating track material that resists misalignment problems that cause nicks and broken blades. Vertical handle and protective guards improve user comfort and safety. Cleans up quickly and easily. Scalloped blade option available on all models. Easy Scooper Note: See price list for scalloped blade ordering information. The Easy Tomato Slicer is ideal for slicing strawberries and mushrooms too. Perfect for keeping fresh tomatoes on hand for hamburgers, subs, salads and salad bars, sandwiches, prep tables and condiment trays. Cut mounds of crisp, fresh lettuce in seconds. Process a whole head of cored lettuce at a time. Scalloped blades and clean slicing action cut one-inch squares with no crushing and no bruising. Replaceable blades for long life; no tensioning required. Cleanup is easy. Just pull one pin to remove pusher block. Clip-on blade assembly lifts out easily. Angled, cast aluminum legs with no-slip feet provide stable cutting platform. Manual locking pin keeps pusher block safely in place until operator releases for cutting. Slicing blade assembly also available. 55650-2 $492.80 For Romaine 1" x 2"
55650-3 $533.50 1/2" x 1/2"
Fresh-O-Matic Steamer by Nemco New and Improved!